Maple Pumpkin Spice Latte — Rose Crown Co.
There’s nothing better than sipping a latte on a nice Autumn day just watching the leaves fall one by one. This latte is as easy as they come, now mine might look like the fancy ones at a coffee shop but man was it tasty! You’ll just need 5 ingredients that you most likely already have in your house and they aren’t filled with artificial flavors which always makes me feel better. Add the maple syrup and spice to the bottom of the mug, stir to combine. Place milk into a microwave safe jar and head for about 30 seconds (or until warm) now place the lid on the jar and shake for a few seconds until milk is foamy. Next pour the hot coffee over the maple syrup and spice, stir well, top with foamy milk, and sprinkle some pumpkin pic spice for a finishing touch. 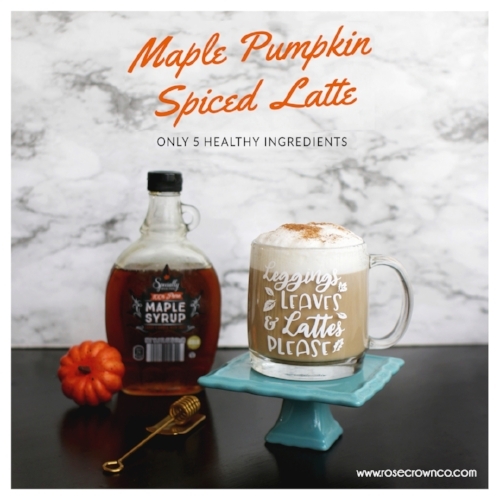 If you make this recipe don’t forget to show it off with a photo and tag me at @rosecrownco on Instagram and Facebook, so I can see how your yummy drink turned out!